It’s a rule of social and political movements that they cannot fully control the outcome of their efforts. Actions cause reactions, many of them unanticipated and certainly unintended. This is because no group, no matter how powerful, can control the human minds of others not part of their cause. This is why so many movements driven by a revolt ethos and revolutionary intentions have created so many unforeseen messes that are often the opposite of their stated aims. So it is with the “Unite the Right” (alt-right, fascist, white supremacist, revanchist, Nazi, and so on) marchers who descended on the peaceful Virginia town of Charlottesville in August. Before you read on, I would strongly suggest that you watch this video on the march. It is truth telling, and it provides the context you need. Donald Trump and many others like to say that there were “good people” marching too, but this ignores the entire title of the rally. The “Unite the Right” theme meant that anyone participating was necessarily putting aside differences with the Nazis and the Klan in order to achieve the goal of becoming a national political presence (the controversy over the statue of Robert E. Lee was only the excuse). The aftermath of the march has been a fallout very different from what they expected. Only a few years ago, the idea of toppling the statues of Confederate generals strewn throughout the South would have been unthinkable. Charlottesville was a test case: perhaps this Lee statue should go, simply because it seems to be a distraction from the progress the citizens want and an unnecessary reminder of a painful past. The city council voted to remove it. This precipitated the rally. To be sure, there are defensible arguments for recognizing the Confederate dead. 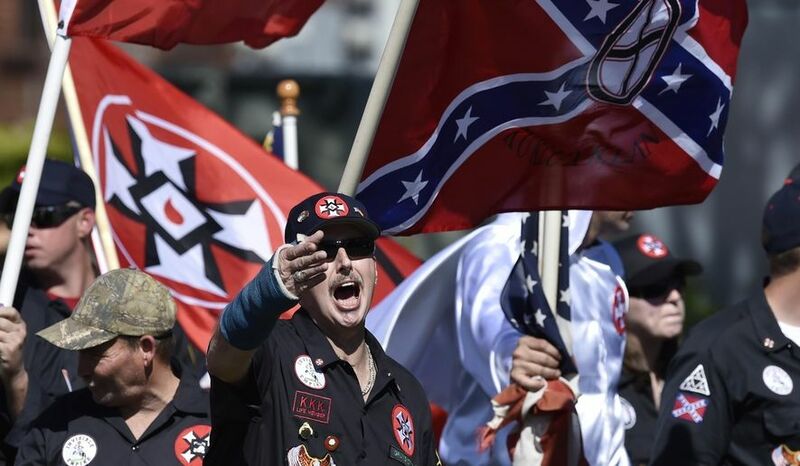 But the protesters were not drawn from a heritage society like the Sons of Confederate Veterans (my great-grandfather was a medic in a Southern troop, and I’m named after Jefferson Davis), but rather the hardest and most bitter among the hard-right, anti-liberal ideologues. That association has further fueled the anti-statue movement among activists, and today none are safe. They are being torn down in the dead of night, all over the country, stricken down by city councils all over the South, and condemned as never before. None will likely survive this. Should the statues stay or not? These statues have a complex history. They were not erected to honor the Confederate dead following the war or even at the end of Reconstruction. Most appeared in the early 1920s to send a message that the race-relation liberalization that happened between 1880 and 1900 would not return. The progress and normalcy would be replaced by a racist/statist/”progressive” movement rallying around new eugenic laws, zoning, white supremacy, forced exclusion, state segregation and so on – policies supported not by the people but by white elites infected with demographic fear and pseudo-science. This is when a movement started putting up these statues, not to honor history but as a symbol of intimidation and state control of association. The statue in Charlottesville statue went up the same year that immigration restrictions went into place for explicit eugenic reasons, and Jim Crow laws were tight and an entire population group faced what amounted to an attempted extermination (that is not an exaggeration but a description of a well-documented reality). In other words, Lee (a tragic figure in many ways) was then being drafted by a wicked movement he would likely have never supported, despite all his failings. So the controversy over whether it should stay or go is not really about the war that occurred a half-century before the statue went up but a symbol of racial control. This is the memory we are dealing with here. It’s very similar to how the Neo-Nazis today are abusing his tragic legacy in service of their dangerous agenda. Instead of fueling some kind of white revolution, the results have been the exact opposite. Most people in those days – never forget that most regular people do not follow 4chan or Twitter – had no idea of the burgeoning movement of hard-right ideologues that was gathering at the time, using Trump for their own purposes. The Charlottesville “Unite the Right” march changed everything. What we saw from online videos and news reports was what looked like a dangerous paramilitary force, none from the city, with optics from the interwar period, carrying torches, Nazi-style insignias, flags, and screaming anti-Semitic and racist slogans. This was not anything like a Tea Party protest. It was something completely different and truly terrifying for the residents of this idyllic town. In other words, it looked deplorable. It was the breakout of this movement into the mainstream. But instead of fueling some kind of white revolution, the results have been the exact opposite. This movement seems anti-American, filled with hate, unchecked by normal civil engagement, truly dangerous to public order, and of strange foreign origin. This did not look like free speech; it looked like a threat. It was not about demanding freedom but rather demanding power. This is what accounts for the shock and disorientation among conservative and Republican commentators who want nothing to do with these people and the ideas behind it. From my point of view, this is a very good. From the point of view of this movement, it is presumably not what they were going for. To understand that requires we plunge into the kind of group psychology that leads to such fanatic movements – too much to take on here. This was not a march about human rights; it was a march about threats to others and a demand for power.The marchers used Virginia’s open-carry laws and protections for free speech and association to their advantage. They also used the plea for tolerating their ideas in order to get a hearing. The ACLU, I believe, was right in fighting for the speech rights of the marchers. That said, this was not a march about human rights; it was a march about threats to others and a demand for power. It has prompted Justice Department investigations, a resignation from the board of the ACLU, and a widespread questioning of how this fiasco that resulted in so much mayhem was ever tolerated to begin with. We are nearly guaranteed to see an increase in government surveillance of hate groups, of monitoring of our online communications, of restrictions on political organizing – all in reaction and response and to the cheers of a terrified public. It is precisely events like this that cause people to lose freedoms, not gain them. If any participants in the “Unite the Right” really believed they were fighting for freedom, they have achieved the opposite. But there is also this: groups like this thrive in persecution. They never go away, especially this one because so much of its ethos is about how they have been suppressed and oppressed. Make them victims and they thrive ever more. The true tragedy of many responses to the march was the false choice it set up: that the only alternative to the alt-right is the leftist antifa. Or conversely, if you hate the leftist antifa, you have no choice but to back the alt-right. This is sheer nonsense. Most of the people resisting what had all the appearances of a Nazi invasion were regular citizens, not antifa. There is nothing “leftist” about resenting the vision of Nazis taking over public spaces. Business loves peace and friendship, not hate and civil unrest. It was a true inspiration to see the response from the merchant class, condemning racism and fascism in no uncertain terms. Business loves peace and friendship, not hate and civil unrest. However, politically, it is unclear whether this response will find a voice. The people most in opposition to the rise of the Nazi movement in America has been the left, and the fallout could actually boost the prospects of the Bernie Sanders movement, as revulsion leads to an embrace of its seeming opposite. Incidentally, this is precisely why it is so important for libertarians to speak out with truth and courageous conviction. We simply cannot allow the left to be the only ideological voice of oppositional. It is probably too early to say what will define Trump’s legacy in office, but his defense of the marchers, and the equation of their bad elements with the other bad elements that opposed them, might be it. It was the very statement that the most indefensible aspects of the alt-right truly wanted. And it was thus no surprise that even some of Trump’s previous defenders bailed on him in the days following. No movement based on the aspiration to rule and oppress others can fully anticipate how their activities will play out over time.You cannot give up your credibility on basic issues like human rights and the dignity of every human life and expect to maintain political support over the long run. We are too far down the path toward peace and universal emancipation to go there. The future is bright and not grim and bloody, as these marchers and their backers imagine. Many people have predicted the end of the Trump approach before, but something does seem different this time. It’s very sad because Trump has many good ideas – ideas that are evidently not that important to him – and represents too many good causes (for which he has done very little) for this to happen. But when you choose to die on a hill of bigotry and intolerance, there is not enough credibility remaining for anything else. No movement based on the aspiration to rule and oppress others can fully anticipate how their activities will play out over time. In this respect, the alt-right has done a terrible disservice to itself and perhaps to everyone else as well. The question is: what are people who love human rights and liberty for all going to do about it? In the end, the only really effective resistance comes in the what we believe and how we live our lives. We have seen what we do not love. The real issue is whether we can find and then build what it is we truly do love. Excellent, piece, Jeffrey. I live in Charlottesville, and for me, like many people I know, the Lee statue has long been a prickly subject, to say the least. BTW, the video was not included in the piece as it came up on my screen.